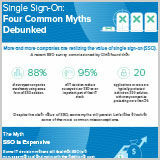 This infographic exposes four common misconceptions about Single Sign-On and explains how modern SSO is a critical component for your organization’s IT stack to increase security, improve productivity and reduce costs. – The adversary is hunting for your security gaps...why aren’t you? With the rise of ransomware and fileless attacks, it's harder than ever to protect your endpoints with confidence.